Snow and sub-zero temperatures in Vancouver in mid-November? That's crazy talk--or so it seemed until last week when the mercury plummeted and everyone was left freezing, myself included. The only solution was to layer, layer, layer. This sweater dress by local label CiCi is one of my favourites because it's cozy and comfortable, but the oversized argyle cowl neck gives it some preppy polish. (If you're not into preppy, it's also available with a gray or yellow leopard print cowl; check the Two of Hearts Boutique for sizes and styles.) The way the boots gape at the top makes me a little sad. I bought them last year because they were fleece-lined and waterproof with a good tread on the bottom--perfect for snow. They fit almost perfectly then, but I must've lost weight without meaning to because they're very loose around the calves now. Oh well. They're still great for snow. I really can't imagine dressing for that kind of weather. I always imagined that you had to wear the most unflattering amount of clothing just to keep warm. You showed me that it isn't true. You can still stay warm and stylish. Love the diamond pattern detail and the boots! I couldn't imagine sub-zero temperature! Must be miserable. But you look very cute. I like your preppy outfit! It's -2 degrees celsius here and I'm layering like a mad fiend. . can imagine how cold it must be over at your side. Stay warm! You look cozy and chic. I still hate the cold though! I'm a summer girl... sigh. Yeah, I heard about the terrible weather in Vancouver! Yikes! What's happening to the world? We're getting nice, above zero temps here in Toronto! And no sightings of snow yet! Oh that is cold. at least you know how to layer and brave the cold stylishly. i don't know if you saw my remark to your blog comment, but mina from faboulista is from vancouver. Love the layering! I don't think I'd survive the cold weather in Vancouver. It's getting down to the 20s in Atlanta and I'm freezing. I definitely need to take a page out of your book and start layering! 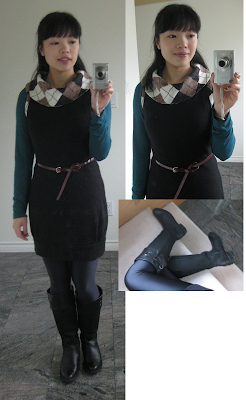 I'm enjoy wearing cowl neck sweaters myself, and I like how you've put together your outfit! Way to work the skinny belt with your sweater dress!